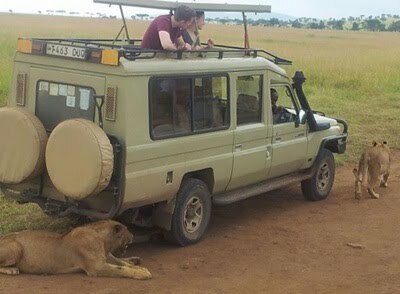 Twende Safari - Great Tours and Safaris in Tanzania! Daily departure: 5 days 4 nights Safari to Tarangire,Manyara,Ngorongoro & Serengeti. You will depart in Arusha town after buying your own picnic lunch to drive ahead to Tarangire National park for game drive. In this day will depart around 08:00 AM viewing Masai steppe on the way which takes 2 hours driving for 120km tarmac road up to Tarangire gate. You will have game drive until late noon then proceed to Manyara for dinner and overnight at Panorama Public campsite. This delightful park, covering an area of 2,600 sq km was established in 1970, and it is the numerous baobab trees that will initially catch your eye. 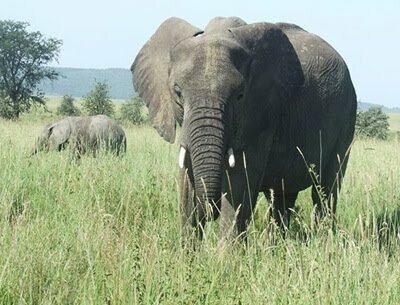 Tarangire National Park derives its name from the Tarangire River that rises in the highlands of central Tanzania and winds its way through the game sanctuary. The river irresistibly lures the herds of plains migrants from the parched surrounding area to its shrunken but permanent brackish waters during the dry season. The animals come by thousands from as far north as the shores of Lake Natron, dramatically swelling the resident population with wildebeest, zebra, eland, elephant, hartebeest, buffalo and fringe-eared Oryx. Tarangire is said to have the highest recorded number of breeding bird species for any habitat in the world. As the rainless days continue the Tarangire pools are clotted with thirsty migrants, and elephants begin to dig for underground streams in the dry riverbed. Day 2: Manyara-Serengeti via Ngorongoro. You will be awaken at dawn for breakfast and after that drive to Manyara national for half day game with your picnic lunch and there after proceed to Serengeti national park via Ngorongoro game viewing en route to the camp. The road is dusty but adventures to takes you 5 hours driving. Dinner and overnight will be Serengeti public campsite. Lake Manyara National Park lies about 120 kilometers southwest of Arusha. Lake Manyara National Park is an ideal size for a day trip. It is possible to leave the camp or lodge early in the morning, picnic at one of the many picturesque sites and return by early evening. Entering the park the tall trees surrounds the ground forest. In many ways it resembles a tropical rainforest - with its verdant foliage and variety of bird life - the difference being these trees are supported by a water supply from underneath rather than by abundant rainfall. Following the formation of the Rift Valley, streams cascaded down the rocky walls and, because there was no outlet, a lake was formed. It was at its largest about a quarter of a million years ago. The average area of the lake is around 390 square kilometers varying from year to year. Day 3: Serengeti-Serengeti game drive. In this day after breakfast you will extend another day in Serengeti National park for full game drive in the park with packed lunch. Dinner and overnight will be at Serengeti Public campsite. Established in 1951, and covering an area of almost 15,000 sq km, Serengeti is one of the most spectacular game parks in East Africa. From its short and long grass plains in the south, which give way to Acacia savannah in the central area, to the hilly more densely wooded areas of the north, and the extensive woodland in the western corridor, Serengeti offers great variations both geographically as well as with the millions of animals, birds and plants that go to make up this complex ecosystem. The name comes from the Maasai siringet, “endless plains”. Twice a year, triggered by the rains, 1.3 million wildebeest, 200,000 zebra and 300,000 Thomson’s gazelle gather to undertake the long trek to new grazing lands. 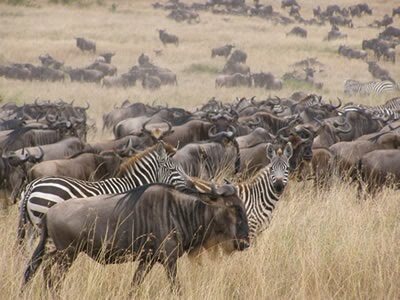 The migration of the herbivores roughly defines the boundaries of Serengeti National Park which is the central zone of the Serengeti ecosystem, an area that also takes in Kenya’s Maasai Mara National Reserve, the Ngorongoro Conservation Area and the Maswa Game Reserve in the west. Within these 25,900 square km of varied landscape live thirty five species of plains game and 500 bird species. Day 4: Serengeti-Ngorongoro Crater. Another day of being awakens at dawn for breakfast then departs to Ngorongoro with picnic lunch. You drive to descend crater floor for tour until late noon whereby you will proceed to Panorama camp for dinner and overnight. Ngorongoro Conservation Area covers 2286 sq km and encompasses the volcanic area around the Ngorongoro Crater - including the still active volcano of Oldonyo Lengai and the famous Olduvai Gorge. Its centerpiece, the Ngorongoro Crater, is the largest unbroken caldera in the world and the first sight of it is breathtaking. The floor of the crater is only 100 sq miles but is home to around 30,000 animals with a high concentration of predators. The crater supports up to 25,000 large mammals. Grazers dominate: zebra, wildebeest - accounting for almost half the animals - gazelle, buffalo, eland, hartebeest and wart hog. Giraffe, for example, stay away because there is insufficient food at tree level; topi because they compete directly with wildebeest. An odd feature of the crater elephants is that they are almost exclusively bulls. Breeding herds - comprising large numbers of females and young with a few attendant older males - are probably unable to find sufficient quality food in the crater. 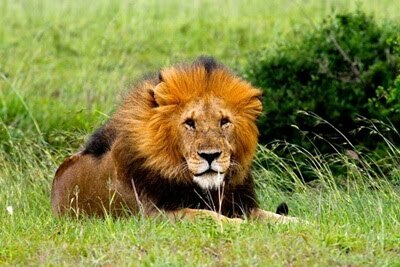 Ngorongoro has carnivores in quantity, drawn by the large herds of prey animals. It has the densest population of large predators, mainly lion - about 100 - and more than 400 spotted hyenas, living in eight clans of up to eighty individuals. Both lions and hyenas will scavenge from each other, depending on weight of numbers and of course, hunger. Most of the bird wildlife in Ngorongoro is seasonal. Also influencing the variety of bird species on display is the ratio of soda to fresh water is the largest expanse of water on the crater floor, Lake Magadi. The lake is alkaline due to deposits of volcanic ash thrown out by surrounding volcanoes. Today will be the day to have breakfast at your leisure time and with optional activity to visit local people and there after proceed to Arusha for your onwards plan.